I began searching randomly for ‘hand made items’ rather than something specific. I then discovered hand made paper and people producing small notebooks from hand made paper. I bought one of these and began sketching some ideas for adding metal clay elements. The notebook sat on my bench for a while with various ideas bubbling around. After a while I realised it was not really inspiring me! I continued my search and had an idea for combining metal clay with textiles. I began looking at hand made textiles – tie-dye, weaving, embroidery, batik and silk painting. I had an idea for creating silver buttons on an item with sentimental value, like a Christening robe. I began looking for hand made Christening robes but found nothing that had the ‘heirloom’ feel I was looking for. Then I came across felting and began looking at felted objects. I discovered the work of Megumi Endo, a London based felt artist. I bought her twisted felt necklace, which really appealed to me. I began the process of collaboration by examining how she had put the necklace together. The construction was very simple – twisted felt ‘beads’ were threaded onto 60cm of satin cord. There was no clasp; the necklace was simply tied to the length required by the wearer. I then began drawing various designs for adding metal clay elements to the necklace. My initial thoughts were to add metal clay elements – probably beads – between the felt beads to break up the black and provide a contrast. I also considered adding a clasp to constrain the necklace to a specific length although I felt that this might be slightly at odds with Megumi’s intentions for the piece. I started off by making a couple of beads in different shapes based on my sketches to see what would work best. I made two tapered beads an inch long and a quarter of an inch wide at the top, with a simple carved line texture, which echoed the twisted felt bead form. After firing, I strung these beads either side of the front bead but they got lost in the felt. To be successful, these beads would have to be much larger which would have made the necklace too heavy. Next I began to explore adding small elements to the felt beads and came up with small discs. Originally my idea was to hang these from the points of the felt beads but this caused the necklace to hang awkwardly so I added them to the beads at random points. I felt that the contrast between the black felt and the polished silver was attractive and really liked the effect of this. It was at this point that I realised the finished product would be too simple for the Registry. Although I loved the look of the necklace I felt it just did not meet the criteria for the project or the level of the work expected for the Registry. I really loved working with the felt so I began looking for another felt artist to collaborate with. I discovered Silversoles, a company run by felt artist Emma Jackson. Emma hand makes a variety of felted textile items. 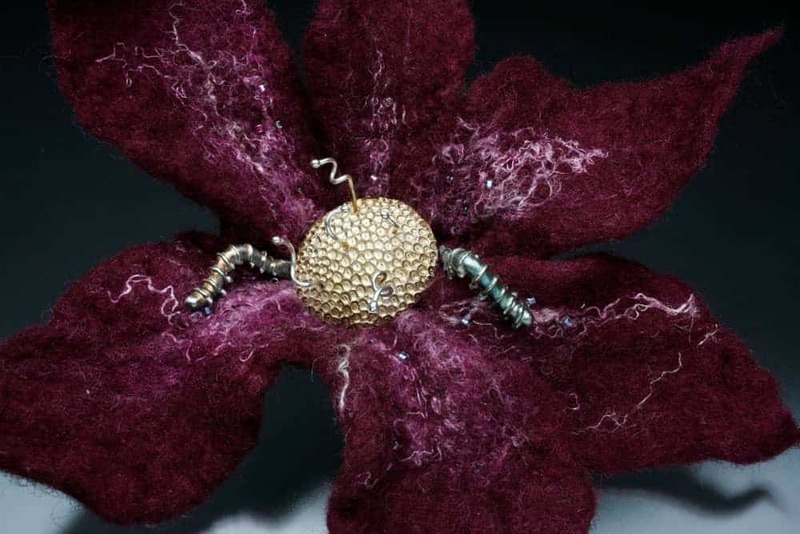 A simple felted corsage really grabbed my attention and I immediately had several ideas for adding metal clay to it. I ordered one and in reality, the corsage was more beautiful than it looked on the website and I was really pleased with it. ​The construction of the felt flower gave me several options for attaching metal clay elements. On my workbench I have a number of fired metal clay items, (a great number actually!) and I began messing around with these and the corsage. A circular domed piece looked good in the centre of the flower and this drove the final design. I made the centre domed element using one of my favourite textures, stingray skin. This texture reminds me of the centre of sunflowers. I attached small rings of fine silver wire to the back of this piece so I could sew it into the centre. 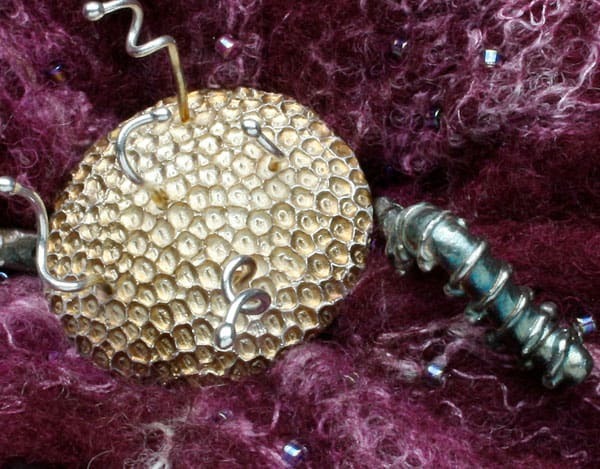 I also drilled holes and added pieces of fine silver wire with balled ends to make a 3D element. I decided this needed some ‘wildlife’ to complete the design so made a number of inchworms. These were great fun to make and I think they have lots of character. The inchworms were sewn on first. I had put a hole in one end of each worm to attach it and then put a loop of thread over the other end of the worms to anchor them. I then attached the domed element using three threads looped through the three rings I had attached to the back. Considering all the work and effort I put into making this piece, it didn’t score well and just scraped a pass. This was a disappointment, 7 out of 10 even though it was a pass. The comments were simple, “Less would have been more with this piece. The wires and worms take so much from the beautiful gold/red patina against the red in the felt. This one should be rethought.” That was it for comment. It’s interesting that my original thoughts for the first felt piece were too simple and I rejected it because I didn’t think it was up to the criteria for the Registry. The final piece was criticised for not being simple enough! You just can’t win sometimes. Buy, swap or in some other way acquire a work made by another artist, such as a lampworked bead, a piece of scrimshaw, a polymer clay object, or an enameled panel. The artist can be living or dead, known to you or not. The first step is to come to understand the work of the original artist, then to augment or collaborate with those intentions to complete the piece using metal clay. The piece can be wearable, functional, or sculptural. There is no size or material limitation. The piece must be accompanied by a one or two page description of the process that should include a personal assessment of the process and the resulting object.